July is whizzing by! I slept 9 hours last night, it felt really good! It wasn't completely uninteruptted, but I feel refreshed. I hope you all slept well too last night. There are 2 days left to enter my birthday giveaway! Please submit your links for this post. Pretty giraffe I saw, while I was visiting Disney's Animal Kingdom Lodge. Bottles and Bottles of Polish shares with us some vintage China Glazes. Emily's Nail Files shows off her Minnie Mouse nails. Let Them Have Polish shares with us her first franken. Like a candy shop shows off Kiko 229. Polish Vixen shares with us her OPI DS colors. Cult Nails starts the pre-sale for her fall line of polishes. Scrangie swatches Limited Edition OCC Lip Tars. Beauty Behaved shares with us her summer jewelry. Liquid Jelly reviews the Deborah Lippmann Get This Party Started set. LadyLuck Beauty Blog gives us the moon and stars in a nail polish. Reflections, Sassy Nails, and Silly Diversions shows off her Pink Wednesday manicure. dameliac shows off her Wet n' Wild and OPI manicure. Make-up/Music/Money/Me shows us how to get your moneys worth from products. DeyiMizu shows off her new haircut and tangerine coral FOTD. I've received two awards recently. They both have the same questionare thing so, I'll show them together. 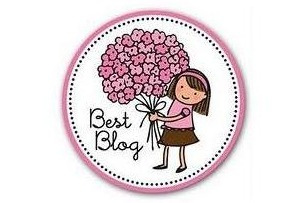 I got the Best Blog award from Libby's Pink Vanity. I also got the Butterfly Award from BeautyBehaved. 1. It has to be really cold in the house for me to sleep. I HATE being hot while sleeping, I always turn the A/C down and bundle up. 2.I never got my ears pierced. I was too scared at 12, and never got around to it. I figure if I got them pierced I'd want a ton of earrings, so why have an added expense? 3. I hate medical settings/doctors offices/hospitals. I'm not afraid of needles or blood. I'm always scared they'll tell you something is wrong with you. I'm a bit of a hypochondriac. 4. Outside of nail polish. I collect The Little Mermaid collectables. I love Ariel and Disney. 5.I was born and raised in Dallas, Texas, but majority of my family is in Atlanta,GA. 6. I played the flute in high school. 7. I'm a forever student. I absolutely love learning. I'm always up for an academic challenge. History is my favorite subject. If I could afford it I'd be in college forever. Your biggest fear-Throwing up in public. I know it's crazy, but vomiting freaks me out. Guilty pleasure- Crappy reality TV, and Americanized Chinese food. I tag anyone who would like to do this! you should show some of your ariel collectables some time? maybe we could share with eachother?